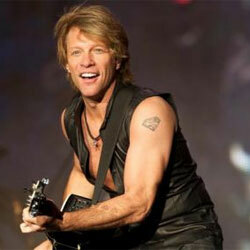 Jon Bon Jovi (born 2 March 1962 in Sayreville, New Jersey), is an American singer songwriter and musician. He is the lead singer for the rock band Bon Jovi, which formed in 1983. The band reached widespread recognition with Slippery When Wet their 3rd studion album released in 1986. Hit singles include Livin' on a Prayer, Wanted Dead or Alive, and their 2000 single, It's My Life. Jon Bon Jovi partnered with Avon to release Unplugged for Her (Oct 2012) and Unplugged for Him (Nov 2012) fragrances.